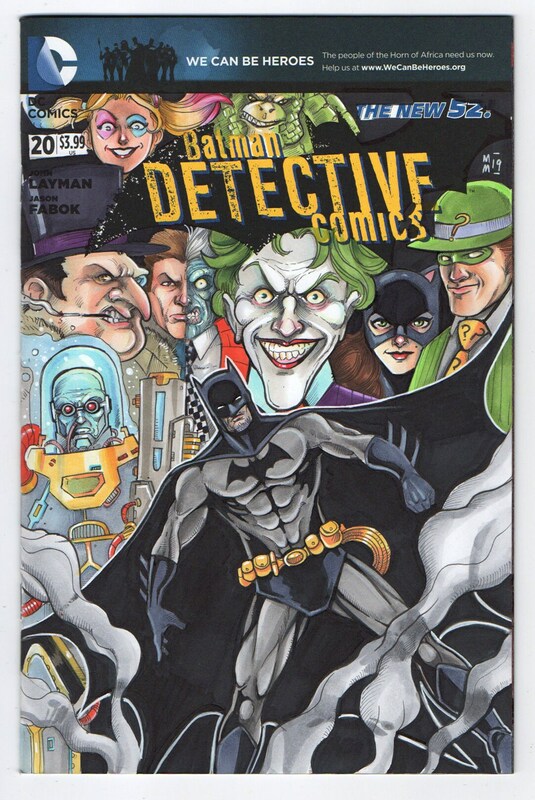 This is an Illustration I created on a blank variant cover of the Detective Comics #20. It feature a full color image (pictured) of Batman and several of his enemies, including the Joker, Penguin, Two-Face, Cat Woman, The Riddler, Mr. Freeze, Harley Quinn, and Killer Croc. The interior of the comic book is the standard issue comic. Please note: This is a full comic book, that features a blank cover for an artist to draw on. The cover is a thick bristol stock with the logo printed on it. In all other ways, it is a normal comic book. This is an original, one of a kind work of art that has not been duplicated in any way. Thank you for looking, and if you have any questions don't hesitate to ask!